Shows Like a Model! 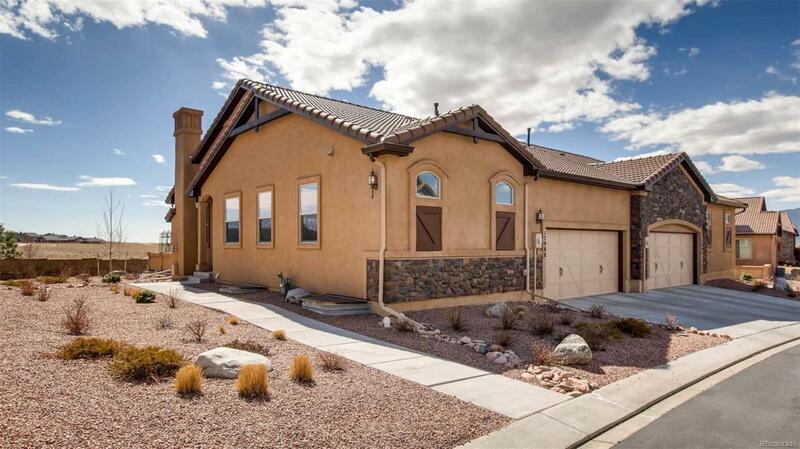 Stunning main level living Patio Home located in Flying Horse. Stucco and Stone Finishes with Expansive Covered Patio. Custom plank hardwood flooring throughout much of the main level. Kitchen boasts high-end Granite counters, island, Staggered upgraded white cabinets, pantry. Iron picket spindles, oil rubbed bronze fixtures & lighting, hand troweled texture, 2 Stone gas fireplaces, main level living and basement family room. Aquasauna home water filtration. Master Suite with dual Vanity in the master bath and large tiled frameless glass shower enclosure. Upgraded carpet, custom tiled bathrooms. 2nd bd on main can also be office/den. Large family room with Gas fireplace in the basement and two large bedrooms and a full bath. Ample storage and large 2 car garage. AC prep package, iron spindles. 214 SF Covered patio with Unobstructed views of Pike's Peak, remote controlled side roller shades to shade patio.